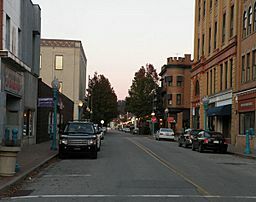 East Main Street, Carnegie, PA.
Carnegie (/ˈkɑːrnɪɡi/) is a borough in Allegheny County, Pennsylvania, United States, and is part of the Pittsburgh Metro Area. The population was 7,972 in the 2010 census. Carnegie is located at . It is approximately 5 miles (8 km) southwest of Pittsburgh. Chartiers Creek runs through the center of the borough. According to the United States Census Bureau, the borough has a total area of 1.6 square miles (4.1 km2), all of it land. Its average elevation is 833 ft (254 m) above sea level. It is part of the 18th Congressional District. Carnegie is named after Andrew Carnegie, who donated one of his libraries for the gesture. 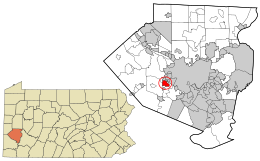 It was incorporated on March 1, 1894. from the boroughs of Chartiers and Mansfield (separated by Chartiers Creek). Later, the borough annexed part of Robinson Township (now Rosslyn Heights). Neighborhoods include Rosslyn Heights, Cubbage Hill, Irishtown, Forsythe Hill, Library Hill, and Old Mansfield. Many neighborhoods were at one time or another mined for coal. The main employers were steel mills such as Superior Steel & Union Electric Steel. Carnegie had a rail yard that had connections to several railroads early in the twentieth century, including the Wabash Pittsburgh Terminal railroad, and the Pennsylvania Railroad. In the 1970s, Carnegie suffered economically with the closure of the great steel mills such as J & L in and around Pittsburgh. In 2004, Carnegie was significantly damaged by flooding as a result of Hurricane Ivan. Much of the commercial section of the borough, as well as the borough's Roman Catholic churches, were closed or damaged. But in about 2014, with the economic upturn, Carnegie's Main Street rebounded, with many new restaurants and small businesses, becoming a popular Pittsburgh-area destination, especially on weekends. Carnegie is a walkable community with many interesting and unique stores and restaurants on its Main Street. Its park is home to a dog park, playground, tennis courts, a hockey rink, basketball courts, baseball fields, walking trails, and Pitcher Skate Park. The Andrew Carnegie Free Library & Music Hall is home to the Grand Army of the Republic Cpt. Thomas Espy Post and Stage 62 theater productions. Off the Wall Productions theater also makes its home in Carnegie, and hosts the annual Pittsburgh New Works Festival. Carnegie is religiously diverse. There are two Orthodox Churches (Ukrainian and Russian), two Lutheran churches, a Ukrainian Catholic church, a Methodist church, an Episcopal church, a Polish Catholic church, a Roman Catholic Church, and a synagogue. In addition, the Attawheed Islamic Center opened in 2011, and the Indian Community Center in 2012. Carnegie also has many local fraternal organizations including the VFW, FOE, American Legion, Elks, Polish Eagles, Polish Sportsmen, AOH, Ukrainian-American Citizens' Club, plus a number of smaller clubs. As of the census of 2000, there were 8,389 people, 3,967 households, and 2,134 families residing in the borough. The population density was 5,076.7 people per square mile (1,963.0/km²). There were 4,249 housing units at an average density of 2,571.3 per square mile (994.3/km²). The racial makeup of the borough was 91.32% White, 5.57% African American, 0.08% Native American, 1.23% Asian, 0.05% Pacific Islander, 0.39% from other races, and 1.36% from two or more races. Hispanic or Latino of any race were 0.99% of the population. There were 3,967 households, out of which 22.7% had children under the age of 18 living with them, 37.4% were married couples living together, 13.2% had a female householder with no husband present, and 46.2% were non-families. 40.4% of all households were made up of individuals, and 18.3% had someone living alone who was 65 years of age or older. The average household size was 2.10 and the average family size was 2.86. In the borough the population was spread out, with 19.4% under the age of 18, 8.1% from 18 to 24, 30.4% from 25 to 44, 22.0% from 45 to 64, and 20.1% who were 65 years of age or older. The median age was 40 years. For every 100 females there were 85.0 males. For every 100 females age 18 and over, there were 81.0 males. The median income for a household in the borough was $32,589, and the median income for a family was $41,371. Males had a median income of $30,792 versus $26,239 for females. The per capita income for the borough was $21,119. About 9.7% of families and 11.5% of the population were below the poverty line, including 19.4% of those under age 18 and 7.2% of those age 65 or over. Carnegie, Pennsylvania Facts for Kids. Kiddle Encyclopedia.